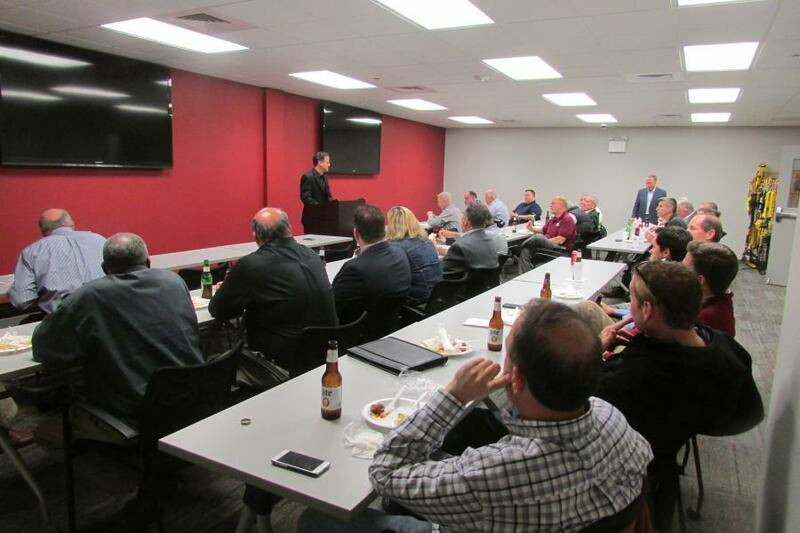 The Delaware Valley Associated Equipment Distributors (DVAED) held its quarterly meeting at Norris Sales Company in Conshohocken, Pa.
Equipment dealers from around southeastern Pennsylvania and southern New Jersey attended the meeting at Norris Sales's spacious new 55,000 sq.-ft. facility. Brian Fraley (at podium), owner of Fraley AEC Solutions LLC, was the guest speaker at the event and discussed tips and strategies for using social media, such as LinkedIn, Facebook and Twitter, to promote equipment sales and rentals, as well as building and fostering relationships with customers. Fraley explained in detail the type of posting content for each social media platform that performs best in terms of views and shares (such as simple equipment postings or tweets), the number of posts that are ideal during a given day and blogging. For more information, visit https://fraleysolutions.com/. Events Norris Sales Company Inc.